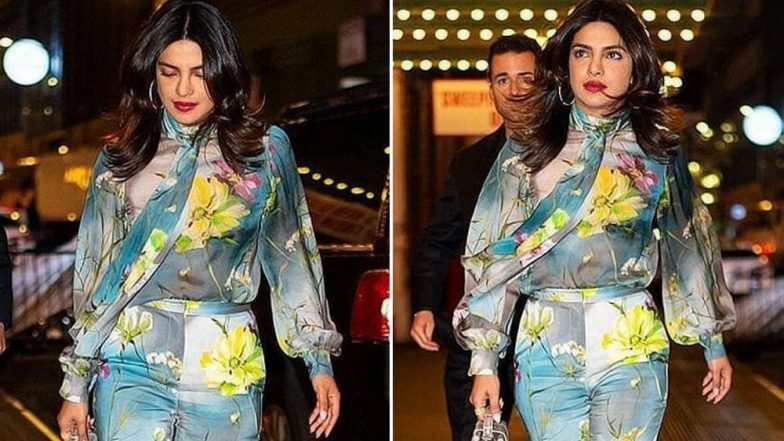 Priyanka Chopra Looked Like a Spring Queen as She Stepped Out in this Floral Outfit in NYC - View Pics! Priyanka was clicked sporting a floral pantsuit. We loved how she chose to wear hoops along with it and the yellow pumps went perfectly well with the outfit. Sporting a dark lip shade and her tresses flowing, PC looked every bit of stunning in her latest outing. Priyanka Chopra on Hosting Met Gala Benefit 2019 with Nick Jonas: It’s an Honour. On the work front, we just heard about one of the most exciting projects that the actress will be seen in. Priyanka is teaming up with Mindy Kaling for a film which will revolve around a big fat Indian wedding, with a Crazy Rich Asians vibe to it. We're too excited to watch these two sassy ladies come together on screen. In terms of Bollywood, Priyanka's upcoming project is The Sky is Pink, starring Farhan Akhtar and Zaira Wasim in lead roles. We hope to hear more on the release date of this film soon.